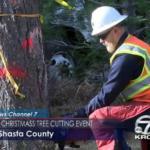 KRCR-TV in Redding broadcast a great story featuring Headrick Logging’s annual practice of cutting, hauling and displaying the “Redding Christmas Tree” for holiday display. With the passing of Jim Headrick last September, the Headrick family has decided to continue the tradition. Click here to see a video of the story. VIOLA, Calif. — The City of Redding invited the community to the 99th Annual Christmas Tree Cutting event in Viola for the Downtown Redding Mall. 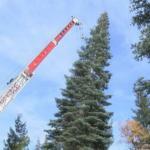 The City of Redding said the tree cutting event has been a tradition since 1919. “[It] gets the community involved. The main thing is people donate their equipment in time. Sierra Pacific Industries donates the tree from their property you see behind us,” said Supervisor Arborist for the city, Jim Calhoun. Those who attended the event are already in the Christmas spirit. One local logging company, Headrick’s Logging, said they’ve been attending with their family and helping with the event for 20 years. “My dad started the company in 1986. Doing this Christmas tree cutting for 20 years now. I believe this is the 20th year. And it’s a tradition that he started and we’re just trying to be a part of keeping it going for not just us, but the city of Redding and everybody around us as far as the community goes,” said Jesse Bacon. If you want to see the tree, you won’t miss it. It’s placed in the Downtown Redding Mall in the California street parking lot and the tree lighting will happen on November 30. for the Winter Fest event.